Ketner's Mill Country Fair is Saturday and Sunday. The mill will be open for tours, and there will be 150 artists and craftsmen showing and 20 food vendors. 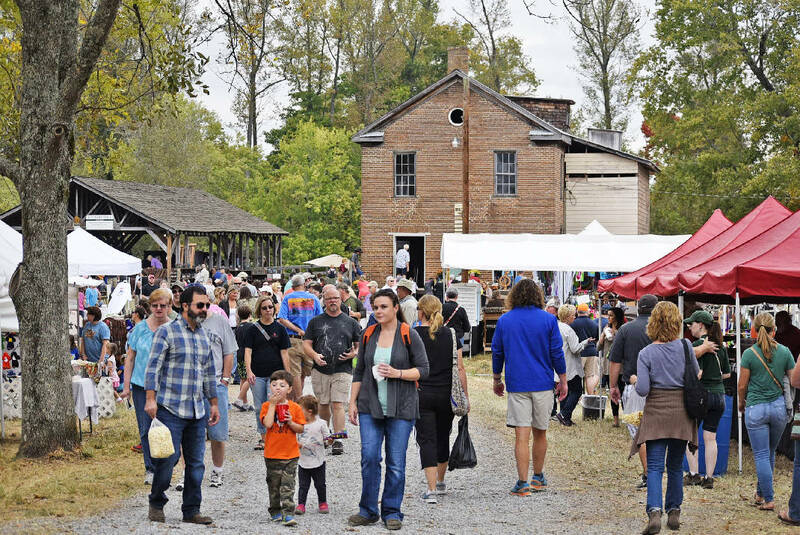 The third weekend of October means it's time for Ketner's Mill Country Fair. One would be hard-pressed to find a better way to spend a beautiful, crisp fall day than browsing crafts, listening to bluegrass musicians and savoring a funnel cake at this outdoor fair in Powell's Crossroads. The fair was established in 1977 by the late Frank W. McDonald to raise funds to help preserve the historic mill. He and his cousin, Clyde Ketner, introduced a new generation to Ketner's Mill. The fair is still run by family descendants and volunteers. This weekend's 41st event will have more than 150 artists and craftsmen exhibiting on the mill grounds. Adults will enjoy browsing a variety of handmade work and listening to bluegrass and gospel musicians while kids will get a kick out of skipping rocks across the millstream or hopping on a wagon ride. The historic mill is always open for tours, and visitors can purchase a bag of Ketner's self-rising cornmeal to take home. Popular party band The Beaters is one of three bands playing the new Big Gig Festival sponsored by EPB in Miller Park on Saturday. Another festival worth taking note of is the new Big Gig Festival in Miller Park sponsored by EPB. Because EPB is nearing its goal of serving 100,000 homes and businesses with its fiber-optic network, the company is celebrating with the Big Gig Community Festival on Saturday in Miller Park. During the event, a portion of M.L. King Boulevard, 10th Street and Georgia Avenue will be closed to motorized traffic to accommodate activities that include a lumberjack show presented by Timberworks, college football on big-screen TVs complete with game-day food from Sticky Fingers, and demonstrations by chefs from 2 Sons Kitchen and Easy Bistro. There will be music by The Beaters, Masseuse and Rare Coalition, food trucks on-site and lots of fun for kids, including a Halloween costume contest, obstacle course, Berry Go Round, free cotton candy and moon walk. Free parking will be available in the EPB parking garage on a first-come, first-served basis. Those parking spots can be accessed through the 10th Street entrance from either Broad or Market Streets. For more information and to see a full schedule: epb.com/BigGig. * Georgia Apple Festival: Ellijay Lions Club Fairgrounds, 1729 S. Main St., Ellijay, Ga., 9 a.m.-6 p.m. Saturday, 9 a.m.-5 p.m. Sunday, $5 ages 11 and older; 47th annual fair with 300 vendors, car show in Civic Center on Saturday www.georgiaapplefestival.org.